With the results of the 2014 Hermes Creative Awards announced, after patting your team and yourself on the back for creating outstanding creative work, what’s the next step? You don’t want to sit on this honorable recognition – you should publicize it! Here are a few ideas to get you started. Twitter, LinkedIn, Facebook, Google+, Instagram … the list goes on. All these platforms are available for you to share your accomplishment with everyone in your network. If one of your colleagues doesn’t like to self-promote, a nice congratulatory tweet or status update is always a nice way to say thanks. Include us in the tweet or plus posting, and we’ll be sure to share or +1. Also, this would be a good time for your team to update their LinkedIn profiles. While you’re there, follow us for inspiration around the industry. This old school communication tool still has value in today’s world. Not only can you publish releases online but many local trade organizations or local business papers often have an awards section where they recognize individuals and companies for professional achievements. Get a little love from your industry peers and position yourself as an expert in your field. 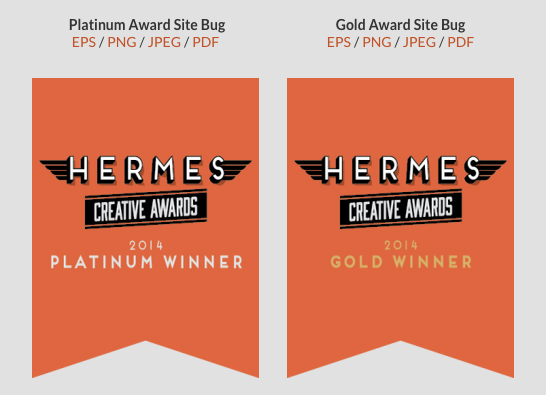 View AMCP’s press release about this year’s Hermes Creative Awards in our graphic downloads area. If you’ve crafted a press release, remember to publish the piece on your company blog. Also, don’t overlook promoting the recognition on the company site. Even a small area on your homepage can provide instant credibility for your firm. If you are a marketing/communications professional, consider creating a devoted awards or achievements page. Would you like prepared graphics? We’ve also have free site badges available here. Good places to publicize your wins are on the company intranet or newsletter. Don’t stop there, though. Is there a bulletin board in a common area? Post a kudos announcement to boost morale. Add a note about the award to the work showcases online. Ex. Put it in the video description on YouTube or include in the results portion of a case study. Create a “Behind the Scenes” video that explains how your team creates award-winning work. 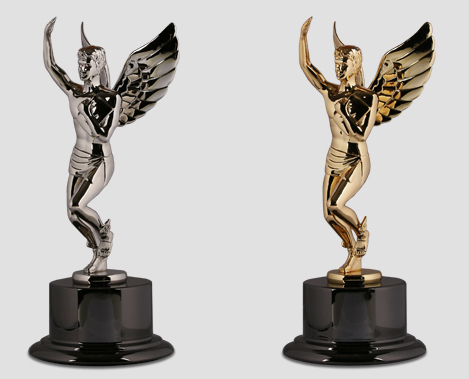 Visit store.hermesawards.com to access winner certificates, free graphic downloads and the statuette store. How do you show off your bling?